The capture mode of MaxAim DI seems to be something simple, after all it is only a regular button on the toolbar. But no, actually it is the kernel of MaxAim, everything else was built around it to ensure the best keyboard and mouse gaming experience on consoles ever seen. The first thing you may notice when entering in capture mode is the absence of mouse cursor, this occurs because the keyboard and mouse are being trapped (or grabbed) by the MaxAim DI. You will not be able to interact with the OS, MaxAim is processing all data from the keyboard and mouse, translating this information to the GPC normalized data format. The translation process is powerful enough to enable any mapping configuration, as well as the mouse translation process, which was highly optimized to give you all the tools need to achieve a PC like movement between your mouse movement and the in-game reticule movement. 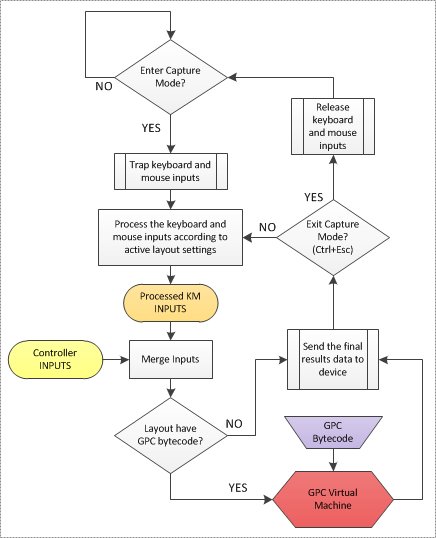 The picture below shows a high level flow chart of capture mode process. To leave the capture mode just press the combination Ctrl+Esc in your keyboard. Side note: despite the keyboard be trapped in capture mode, some OS key combinations can not be blocked, like Ctrl+Alt+Del and Alt+Tab. And if, for any reason, the MaxAim DI window loose the focus, the capture mode will be automatically ended.